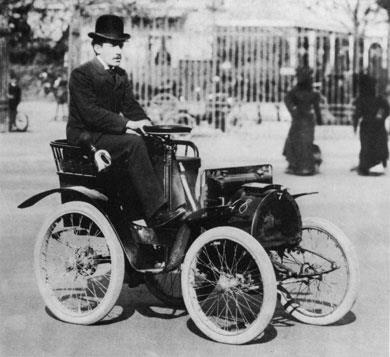 To publicise the cars that he had been making for several months, Louis Renault decided to participate in car races. These were organised by the Automobile Club de France created in 1895 to promote this brand new sport. Eight months after developing his first small car, Louis Renault entered the Paris-Trouville race with his brother Marcel. Achieving first place in their category made them well known and drove up orders: 71 orders were recorded by the end of 1899. You had simultaneously to be a mechanic, a good driver, tough and intrepid to set off on bad roads in vehicles that were far from comfortable. Adventurous and a risk-taker, Louis Renault trained his brother Marcel on town-to-town courses. Victory was the most frequent outcome at meetings such as Paris-Rambouillet in October 1899, Paris-Ostend (1899), Paris-Toulouse (1900), Paris-Berlin (1901) Paris-Vienna (1902) ... Until the tragic accident that cost Marcel his life in the Paris-Madrid race of 1903. Deeply affected, Louis Renault stopped racing for a while. He devoted himself fully to developing his company where he worked in association with his brother Fernand before the latter retired leaving Louis as the sole master in charge of the vessel in 1908.